For those who have always wondered if the mountains of the Yukon could compare to the Alberta Rockies, book your flight and head to Kluane. These mountains speak in their own way, the dark granite giants of the St. Elias Range hold a vastness and wildness that I have never felt in the Rockies. 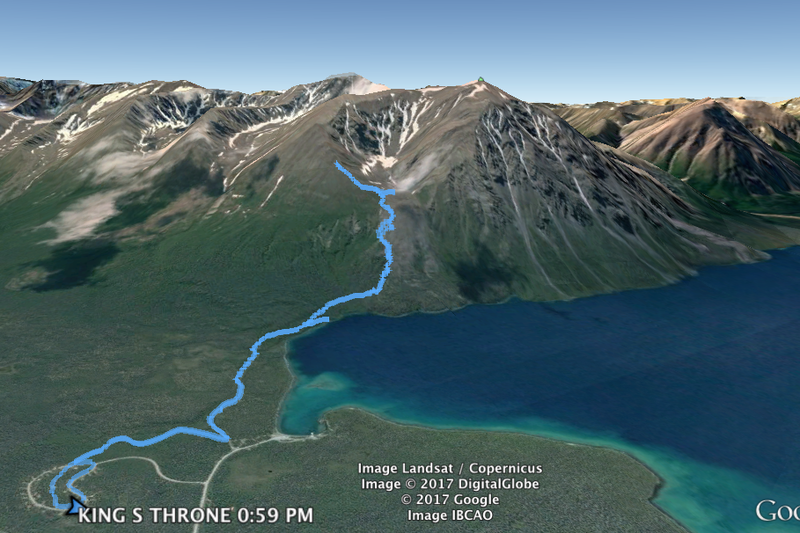 The highest range in North America with the interior ice-field summits scraping 6,000 M. From the road (approx 800m elev. ), the peaks you and hike will see are just over 2,000 m. Comparable to the to Rockies in terms of elevation gain, but the subtleties are different. Fluorescent lichen, alpine ferns and a beautiful pattern of avalanche paths that streak down every crack in the mountains give the edges of this range a feeling all its own. Dall Sheep wander the slopes and the imagination surges with the thoughts of gigantic moose, caribou, wolverine and bear. Our hike, King’s Throne. Starting at Kathleen Lake Campground we follow a wide trail to at the base of the mountain. After a short detour to be swarmed by fish flies at the lakeshore, we begin our climb. A moderate grade up switchbacks past lupines and crocus. Into the dark rock, the views behind unfold into a boreal canvas with lakes and several hues of greens. The distant rolling mountains to the east contrast with the jagged peaks and snowfields of western ranges. And the jewel of Kathleen Lake grows into view with each step. Upon reaching the throne (cirque). We rest and a few clamber up the ridge. We started late, 12:30 pm, but with a sunset at 11:30 and twilight all night, this was hardly a problem.